As mentioned within last month’s diary update, Coniston, within the Lake District, UK, saw its annual power boat ‘Records Week’ take place from the end of October through to the beginning of November. As part of that international event we are very grateful to Nikki Drummond for assisting with writing the following account of the Jelf Racing Team’s time competing there this year. 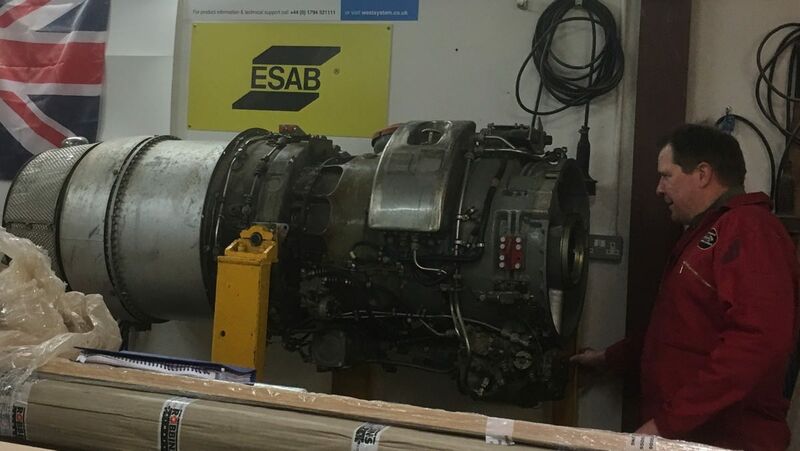 For those of our readers who do not know, Ben (now aged 18), is the third generation of the Jelf family to take up powerboat racing, his father Colin and grandfather Ted having both been previously awarded the prestigious K7 Gold Star from the K7 Club that was founded by the late Donald Campbell CBE back in 1957. The term ‘K7’ relating to the full title of Donald’s Outright World Water Speed Record craft, his jet hydroplane, Bluebird K7. 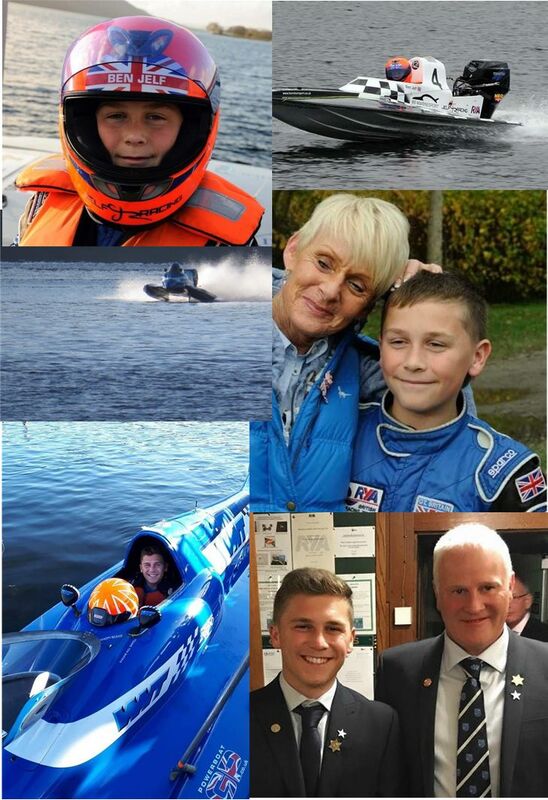 Back in 2011 Ben became the UK’s youngest powerboat World Record holder in the GT15 class. For this year’s Records Week Ben and the family brought a boat that was able to compete in both the F2 and SuperCat classes. With near perfect weather conditions of little wind and calm water, Ben kicked the week off by setting a new British RYA Record in the SuperCat class at 101.26mph making him the youngest person in the UK to break the 100mph barrier on water at an officially timed event. Not content with that and feeling the boat was capable of going faster, he went out again and raised the bar even higher to 115.28mph. Ben then set a new British F2 Record at 110.60mph. Later that week and with the weather remaining calm, Ben went out again and bettered both of those SuperCat and F2 class records, with speeds of 124.38mph and 124.27mph respectively, which was an amazing achievement. This was duly recognised by the K7 Club who awarded Ben his very own Gold Star. I’ve been coming to Coniston to break records over the past seven years now. I met Donald Campbell’s daughter Gina when I broke my first World Record at the age of 11. Since that day my aim has been to break that 100mph barrier and to do it at the spiritual home of Speed Records on water, where Donald lost his life in pursuit of his dream, means so much to me! It’s not easy to break that 100mph I’ve had to wait until I was 18 and allowed into a boat capable of the speeds required. It’s been a great achievement for the team and to follow in Dad and Grandad Ted’s footsteps and all those who have also broke the 100mph Record is what dreams are made of. There are a lot of people on the K7 list that I’ve watched race and grown up hearing stories about and look up to. I’m really lucky to have the opportunity to follow my dreams with a fantastic team and support and I’d like to think Grandad Ted would be proud of me, he owned the 22nd K7 Gold Star awarded and it was in my overalls pocket with me all week. When most young adults would be leading busy lives socializing with their friends, Ben can be found in the workshop working on the team’s boats and preparing for races. This dedication that he shows to his and his team-mates racing is something that as a parent I am most proud of. The Longbow Project wish Ben and his Jelf Racing Team every success for 2019. As young Ben continues to forge his career in the world of speed on water, we pay tribute to the fastest woman on water, American Kitty Linn O’Neil who sadly passed away this month. 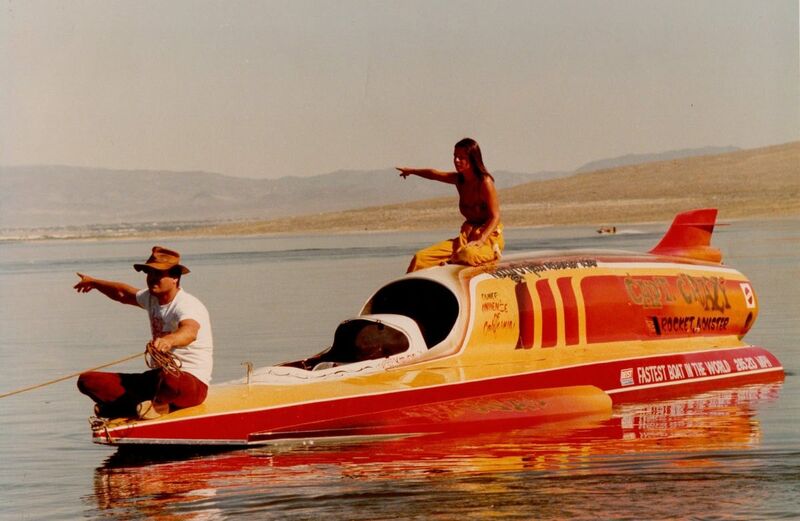 In 1977 Kitty drove the jet hydroplane built by Rich Hallett that had ten years previously become the Outright World Water Speed Record holder at 285mph in when driven by Lee Taylor. Kitty at only 5’2″ tall was part native Cherokee and after contracting a childhood illness she became profoundly deaf for the rest of her life in addition to having two treatments for cancer in her twenties. None of this stopped Kitty who excelled at sports and then went on to become a leading stuntwoman for film and television appearing in amongst others, Smokey and the Bandit II, Wonder Woman and The Blues Brothers setting a high fall record of 180 feet. The jet hydroplane she was about to drive was originally called Hustler but later bought by Jim Deist and Bill Dunlap and renamed Captain Crazy. By this time the boat was tired at 13½ years old but nevertheless the boat was taken to Walker Lake in Nevada for Kitty’s attempt to be the fastest on water. The seating position in the boat was virtually laying on your back on the timber frames of the hull with your head tilted up to see over the bow. There was no safety capsule like we have today and not having driven the boat before Kitty did a run of 150mph straight off the bat for what she classed as a ‘warm up familiarization run’. For anyone who has done 150mph on water they will tell you that is seriously fast let alone doing it having to lay down on your back but Kitty was about to show everyone why she was simply outstanding at speed record attempts. On only her second run of the jet hydroplane she ran through the timing traps at an incredible 275mph with her peak speed well above that. The protocol for outright records both on land and water is a return run must be made within the hour and the average speed between the two runs is then calculated to set the speed achieved. Even though Kitty was fearless she was inherently talented enough to report back to Deist and Dunlap that the boat was simply too old and consequentially she doubted it would hold together at those speeds for a return run. To be able to run 275mph on only her second drive of the boat then to have the knowledge and maturity to say no the boat has reached its limit for its age, under what must have been tremendous pressure to make that return run, for us marks her out as simply one of the best and a lesson well to be learnt from those who would follow, if it doesn’t feel right, if you think you are right on the limit, then stop and resolve the issues. 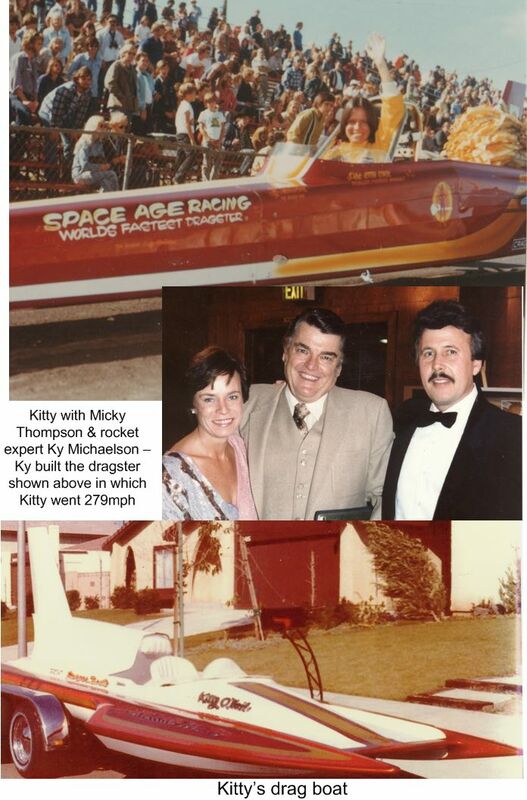 Kitty wasn’t afraid to go fast, only the year before in 1976 she drove the rocket car called SMI Motivator to an average speed of 512mph peaking at 621mph to become the fastest woman on land. 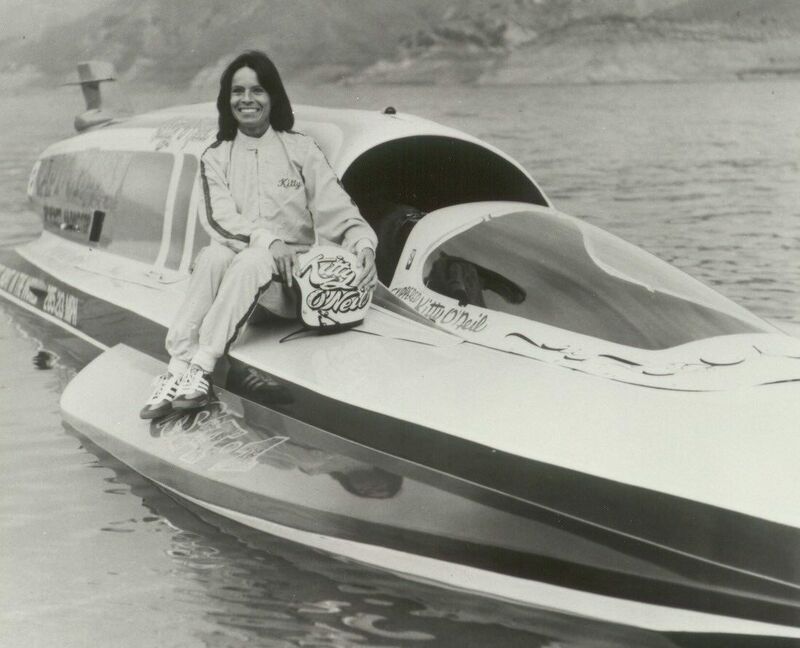 In all she set 22 land and water speed records including a water ski record of 104mph and a film of her incredible life was made in 1979, called Silent Victory, The Kitty O’Neil Story, starring Stockard Channing. Returning to the build of Longbow we had a visit to the workshop this month from her future pilot DJ taking time out from his military flying career to look over the building of the hull to date, do some ongoing inhibiting of the twin jet engines that will power her and to have a chat with the rest of the team, Steve, Neil, Keith, Fred and myself about how things are progressing. 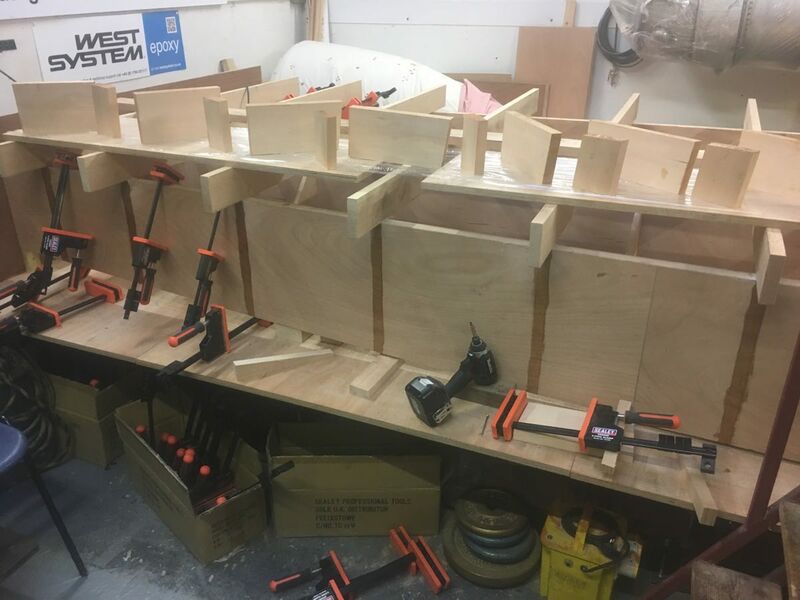 After setting the horizontal timber frames onto the main bearers with West System epoxy, the next task as we built this stage of the hull upside down, was to form the vertical timber frames that will separate those outer bearers from the sides of the hull. 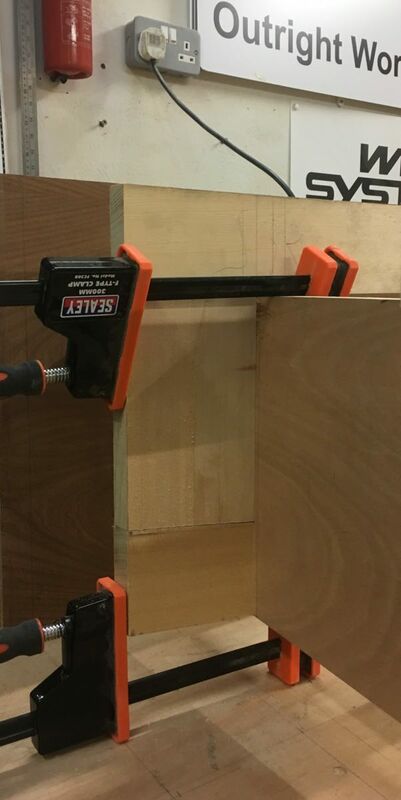 As the outer main bearers are curved along their entire length and each frame station is of a differing height and width, this means that each of those vertical timber frames, which themselves consist of multiple pieces of timber became like a massive jigsaw for Steve to cut and shape, then trial fit for assembly. Numbering of each part was essential otherwise we were just going to get lost with so many different sections of wood that all looked similar to each other, that had to be primed with epoxy then wait, have a brew and a natter whilst the epoxy becomes tacky. 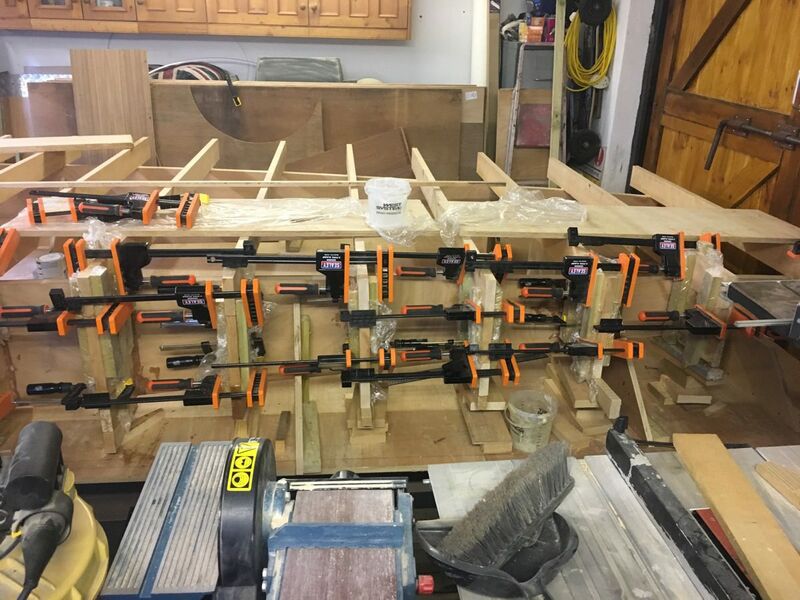 This period of hanging around for the first coat of epoxy to go tacky is welcomed before the fun really starts with a second coat of epoxy with filler, then all hands on deck to assemble each of the parts together with wedges, a multitude of clamps and temporary holding battens wrapped in clingfilm. 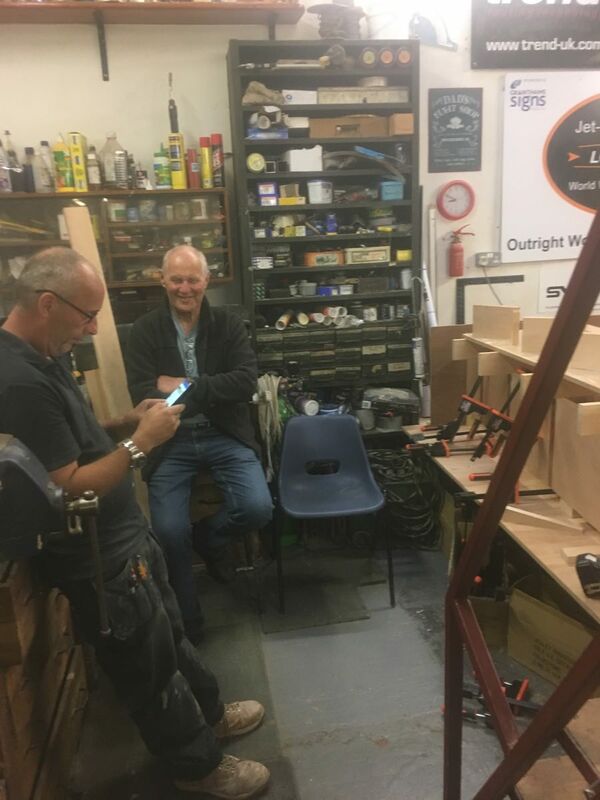 The latter being essential if you also don’t want to have said battens being a permanent fixture to the hull if they come into contact with epoxy, not mentioning any names…..Fred! Building the frames up doesn’t end there though but we hope with the photos we will release within next month’s update that you will start to see Longbow taking shape. Also Dave Warby and his team Warby Motorsport are back at Blowering Dam in Australia for further testing with his jet hydroplane Spirit of Australia 2 at the start of December. As we get used to winter it is summer time for them so the dam is much lower than in the winter months as they release water from it for the farmers but still good enough for some high speed runs if all goes well. So good luck Dave and team. Thanks for tuning in and following our venture, as always please spread the word and see you next month folks!